In a previous Creation Moment, I referred to the Cassini space program studying Enceladus – a moon of Saturn. Two interesting new studies about ocean-covered worlds like Enceladus have recently been published, giving conflicting information. New Scientist reported that a Russian billionaire, Yuri Milner, was hoping to fund a private space program to Enceladus in order to investigate its oceans more fully. 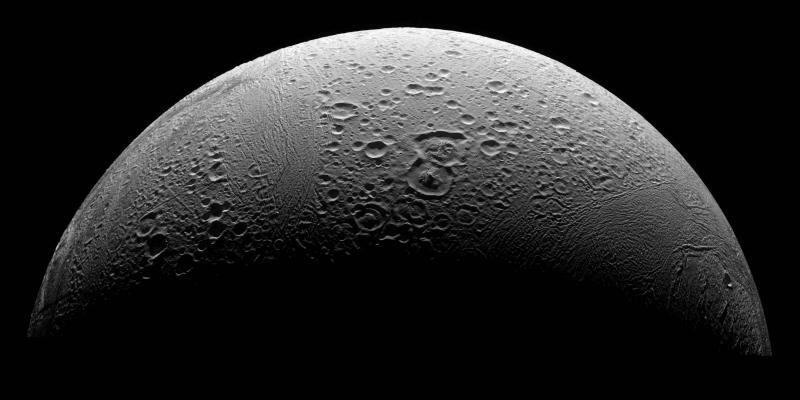 Cassini had noted that there might be hydrothermal vents on Enceladus. Such vents on earth produce fountains of hot water rich in minerals such as sulfur and phosphorus. Milner’s team would hope to find evidence of such minerals in the vents on Enceladus. It is the belief of many scientists that such mineral-rich vents on earth could be where life itself originally evolved. Such evolutionists think, therefore, that worlds like Enceladus offer the best chance of discovering life in our solar system. Yet, the day before this news article was released, another New Scientist article was casting doubt on the candidacy of such ocean worlds being able to support life. It is thought that phosphorus, being locked away inside rocks, would not be able to leech out into salty sea. The New Scientist article suggests that any phosphorus getting into the water would be quickly washed away. We would not have strong enough solutions to produce an appreciable concentration of phosphorus. So this method of production would not work. With a biblical worldview, we know that life cannot arise from non-life, but even if it could, it seems that whatever phosphorus was produced would be washed away before it could do anyone any good. Ocean-covered worlds would be dead. We realize the truth, Lord, that without turning to You, we come up with the strangest of ideas. Thank You that You have given us a better basis for knowledge and wisdom, which should begin with the fear of the Lord. Amen. Ref: < https://www.newscientist.com/article/mg23631533-900-private-mission-may-get-us-back-to-enceladus-sooner-than-nasa/ >, and < https://www.newscientist.com/article/2154137-ocean-covered-planets-may-not-be-the-places-to-search-for-life/ >, accessed 11/27/2017. Image: Public Domain.